I decided to change the shape of the elephant's body recently, and I'm pretty happy with how it turned out. This guy stands around 12 inches tall now (whoa!). It sorta seems like my animals are getting bigger and bigger. 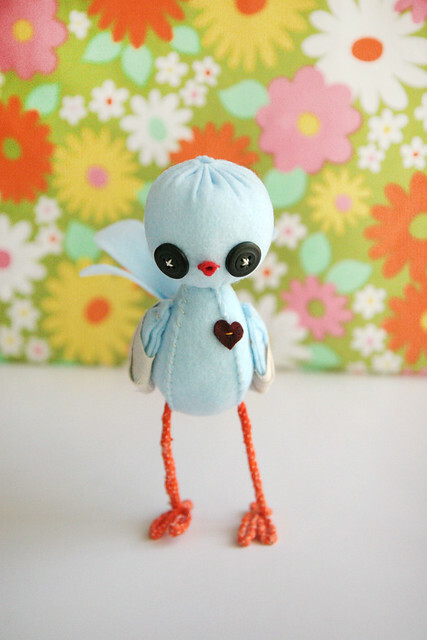 This little bluebird was a special custom request. He has little bandaged wings which makes him both adorable and a little sad. Oh my gosh! They are so, so beyond adorable. 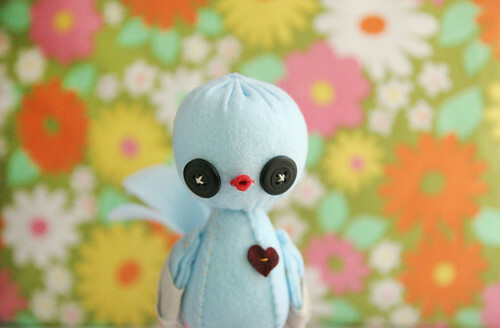 I love that poor little on-the-mend birdie!!! These are beautiful, Katie! I'm always so impressed with how perfect your stitches are and just the level of craftsmanship that you have with these creatures! So impressed! 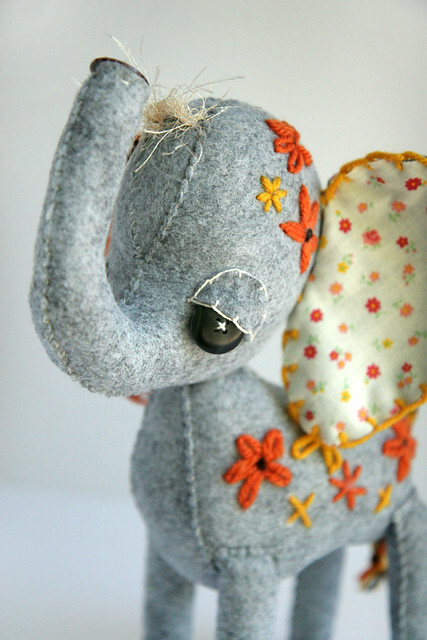 I love how the sewing looks like eyelashes for the elephant! And the little flower details are cute too. Your stuff would look perfect on a mobile, I think! you are incredible! every new animal i see turns into my new favorite, they are all so wonderful and beautifully made. Wow, this is so cute! Love them! Oh, wow, they're sooo pretty and adorable...! that little bird! i love his little wings, even though that is kind of sad...you are so talented! I love your creatures and their droopy little eyelids! They have a slightly sleepy look to them that is so cute. My eyes kinda look like that, too. My mother calls them bedroom eyes, but I think I just look sleepy! Katie- these little fellows are adorable!! That elephant just melts my heart!! 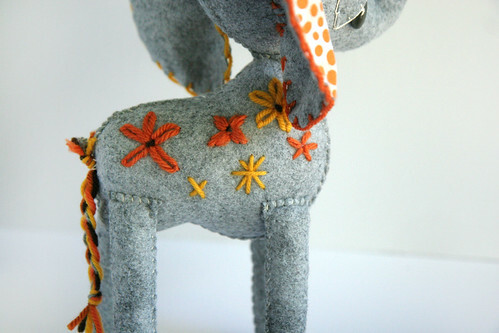 I love the miss-matched ear prints + the little daisies on the body!! TOO cute!! omg the bird is SUCH A CUTIE!! That little birdie is the sweetest ever!! sigh. I am in love with that elephant. love it...as usual. Happy Tuesday friend. Your elephants are one of my favorites. I adore their ears. oh, I want to take these little guys home with me! They are seriously way too cute. out of control amazing. the mobile will be amazing. the little birdie is so precious. you are talent.ED! Oh muh goodness! I LOVE the elephant! They're both stinkin adorable but the elephant just makes my heart bounce! 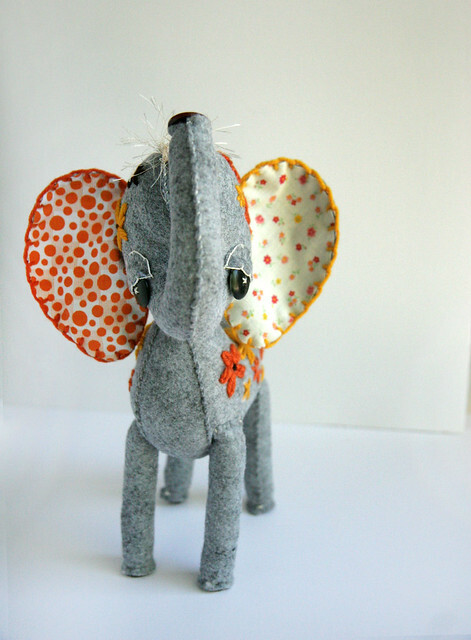 i love love love that the little elephant has two different ears! and that bandaged bluebird is just dang cute! Yay!!! Mention of my mobile... I can't wait! I can't believe I am the first to ask you to make one. are wonderful, I never tire of enjoying your creations are very adorable. i love all of your adorable creations! OMG, elephants are my fave! That is the cutest things ever && I want one!